You are now a Futsal Parent! Your kid is now part of a soccer team, might be expected to go to practices, show up for games on weekends. But you as the parent will play a very important role too! Aside from the obvious (drive your kid all over town to practices and games) you are the most important supporter of your kid! Be sure to be on time at the game (usually at least 30 minuted before kick-off). If your kid has the first or last game of the day parents might be asked to help put up goals or take them down. If they are not setup on time the referee will shorten the first game accordingly. You might also be asked to volunteer as a score keeper. Not criticize the players, coaches or referees in front of other spectators. Accept decisions of the game officials (including referees and coaches) on the field as being fair and called to the best ability of those officials. Not criticize an opposing team, its players, coaches, or fans by word or gesture. 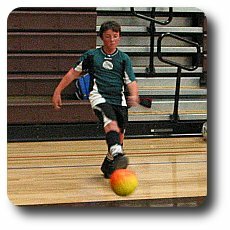 Refrain from using physical or verbal abuse or profane language at any Futsal San Jose function. Not be in possession of and/or drinking alcoholic beverages or using any illegal substances during any soccer activity. Smoking is not permitted in any activity around children. Not interfere/interrupt the coaching staff before, during, or after games or at practices. 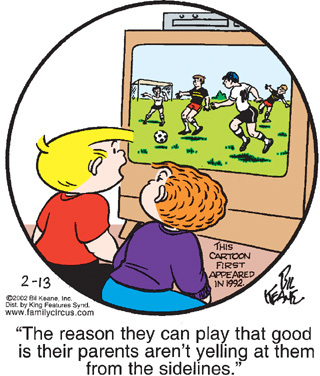 "For some reason, adults - some who can't even kick a ball - think it's perfectly okay to scream at children while they're playing soccer. How normal would it seem if a mother gave a six-year-old some crayons and a coloring book and started screaming? "Use the red crayon! Stay in the lines! Don't use yellow!" You think that child would develop a passion for drawing? Most important, parents must realize that playing sports is a way for children to express themselves." Relax and enjoy the game! Cheer ANY and ALL success on the field. It DOES NOT matter what player OR team. They are all kids and they want you there to see them play. Never reward what you perceive as success. Never punish what you perceive as failure. Don't evaluate your child's performance, he or she is playing to have fun, not to earn a grade! If he/she had fun, the day was a success. 4 seconds to bring the ball in play, otherwise the other team gets the ball. If you are interested in the exact details please read the Laws of the Game.